Lipids and lipoproteins are essential for a variety of biochemical processes and serve as hormones and energy reserves in addition to forming key elements of cell membranes. In disease states, lipids are most frequently monitored in association with atherosclerosis. Laboratory testing is essential for determining when to institute drug therapy and for monitoring disease progression. Understanding the role of the laboratory in management of dyslipidemia is essential for pharmacists as atherosclerosis and cardiac disease are the leading cause of death in developed countries. Cholesterol and fatty acids are absorbed from the GI tract as chylomicrons (Figure 1). Chylomicrons are primarily triglycerides (90%) combined with cholesterol and apolipoproteins B-48 and A. In combination with HDL, apolipoprotein C, apolipoprotein E and lipoprotein lipase, a small percentage of the free fatty acids are released from the chylomicron triglyceride component. The free fatty acids are then taken up by either muscle or adipose cells. The remaining chylomicron remnant which contains 80-90% of the initial triglyceride component can then be internalized by hepatic cells. 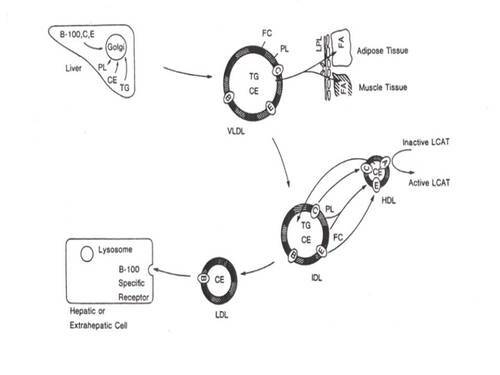 Hepatic cells synthesize triglyceride rich VLDL which is then released into circulation (Figure 2). 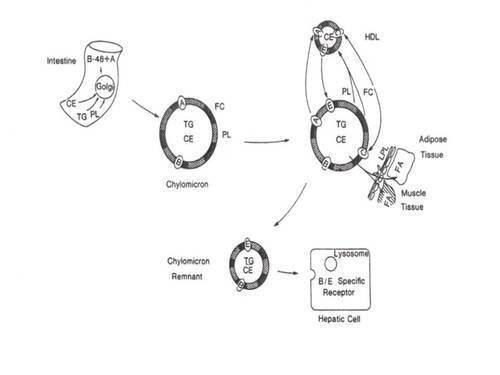 Apolipoprotein CII activates lipoprotein lipase which releases free fatty acids to endothelial cells. The remaining VLDL remnant can either be taken back up by hepatocytes or be converted into IDL. Further metabolism results in LDL, where most of the triglyceride component of VLDL has been replaced with cholesterol. The major components of the various lipoprotein classes are shown in Table 1. From a clinical perspective, monitoring and reducing LDL is a primary goal of therapy. The LDL goal is determined by risk factors. The very high risk category includes patients with a recent MI or a combination of cardiovascular disease and diabetes. Patients with established CHD (coronary heart disease) or equivalents (e.g., diabetes) have an LDL goal of < 100 mg/dL, whereas for people with fewer risk factors higher levels of LDL are considered acceptable. An 83-year-old white man with a diagnosis of acute myeloid leukemia (AML) received remission induction chemotherapy consisting of anti-CD33 antibody conjugated with a cytotoxic anti-tumor antibiotic, calicheamicin (gemtuzumab ozogamicin). His past medical history included congestive heart failure, hyperlipidemia, and hypothyroidism. He had been taking simvastatin for nearly 2 years. The patient tolerated the chemotherapy well and was discharged on his previous medications, including simvastatin 40 mg once daily, digoxin 0.25 mg once daily, and levothyroxine 0.075 mg once daily, as well as levofloxacin 500 mg once daily, acyclovir 400 mg twice daily, and fluconazole 400 mg once daily, given as prophylactic antimicrobial therapy in the setting of neutropenia. One week after discharge, the patient presented with severe generalized muscle weakness. There was no history of trauma, fever, alcohol use, seizures, or systemic inflammatory diseases. He was afebrile, and other vital signs were also normal. Examination revealed 2 of 5 strength in all 4 extremities and decreased ankle reflexes bilaterally. Notable laboratory values included serum creatine kinase (CK) 52,716 U/L, CK MB fraction 81.5 ng/mL, serum creatinine 1.2 mg/dL (baseline 1 wk earlier 0.9 mg/dL), blood urea nitrogen 30 mg/dL (baseline 1 wk earlier 16 mg/dL), troponin I < 0.4 µg/L, calcium 8.3 mg/dL, potassium 5.1 mEq/L, alanine aminotransferase 724 U/L, aspartate aminotransferase 2367 U/L, alkaline phosphatase 187 U/L, thyroid-stimulating hormone (TSH) 37.7 µU/mL, and unbound thyroxine 0.61 ng/dL. Urinalysis showed brown urine, pH 5.0, abundant pigment casts, and a red supernatant after centrifugation. Based on the CKMB being greatly elevated (normal is < 12 mg/dL) did this patient suffer a myocardial infarction? Is the elevated CKMB consistent with the troponin result? How do you interpret the creatine kinase concentrations in this patient? If the patient is treated effectively how long will it take to normalize the CK values? Why is the serum potassium slightly elevated? How do you interpret the transaminase (ALT and AST) values for this patient? How do you interpret the thyroid function tests? How do you interpret the urinalysis data? Is this a common finding with these types of drugs? A 41-year-old man presents for assessment of severe hypertriglyceridemia. He has previously been well. His lipid levels were checked because his serum appeared milky on screening for dyslipidemia. He has no history of abdominal pains, his medical history is unremarkable (in particular, no diabetes mellitus, hypothyroidism, obesity or pancreatitis), and he has no family history of premature coronary artery disease. He does not drink alcohol excessively and is a nonsmoker. The physician records his height (180 cm), weight (80 kg) and abdominal circumference (86 cm). Other findings on physical examination are unremarkable. The fasting lipid profile reveals a total cholesterol level of 300 (normally < 200) mg/dL, a high-density lipoprotein (HDL) cholesterol level of 9 (normally > 35) mg/dL and a triglyceride level of 2672 (normally < 200) mg/dL. The patient had previously received treatment with 2 statins, in increasing doses, without a decrease in triglycerides. How should the patient’s lipid profile be classified? How should the patient’s dyslipidemia be managed?